Railpictures.ca - Bill Thomson Photo: Canadian Pacific SW1200RS 8161 switches the Seagram’s Distillery plant in Waterloo. The locomotive is coming back onto the street-running portion of the Grand River Railway line on Caroline Street, at Mile 15.4 of GRR’s Waterloo Sub. The GRR and LE&N were operated as an operating division of CPR, and while the power was lettered CP, in the timetables and on the Preston facilities GRR and LE&N were used. 8161 was one of the trio of regularly-assigned GRR units 8160-8162, that operated on CP’s old Electric Lines (GRR and LE&N) based out of Preston. When one went to Toronto for maintenance, it was always insisted that “their” unit be returned back to the GRR (a lot of the time if a unit stayed at an outpost for an extended period of time, the crews took better care of it). The Seagram plant, which was the original Seagram distillery built during 1857 in Waterloo, closed in 1992 and has since been converted to condos and office space. Street-running along Caroline St. ended in July 1993 when the last train lead by 8161 and sister 8162 traversed this GRR trackage. 8161, not rebuilt in the 1200-series rebuild program of the 1980′s, was sold off in 2004. | Railpictures.ca – Canadian Railway Photography – photographie ferroviaire Canadienne. 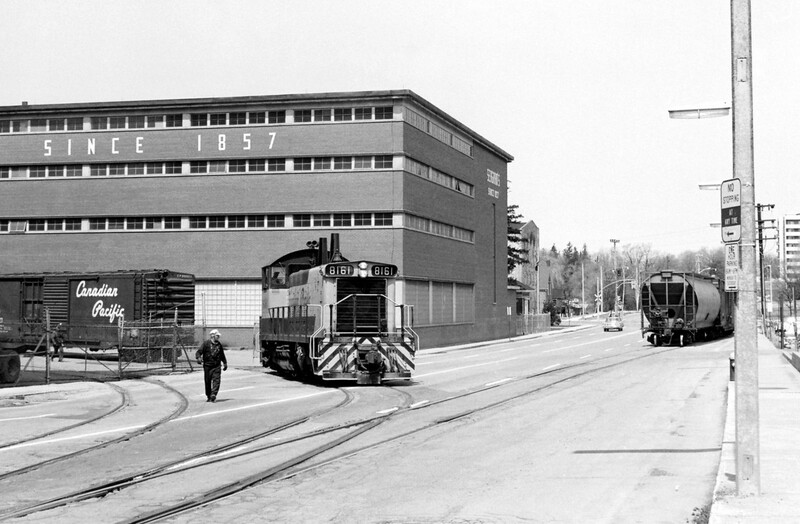 Caption: Canadian Pacific SW1200RS 8161 switches the Seagram's Distillery plant in Waterloo. The locomotive is coming back onto the street-running portion of the Grand River Railway line on Caroline Street, at Mile 15.4 of GRR's Waterloo Sub. The GRR and LE&N were operated as an operating division of CPR, and while the power was lettered CP, in the timetables and on the Preston facilities GRR and LE&N were used. 8161 was one of the trio of regularly-assigned GRR units 8160-8162, that operated on CP's old Electric Lines (GRR and LE&N) based out of Preston. When one went to Toronto for maintenance, it was always insisted that "their" unit be returned back to the GRR (a lot of the time if a unit stayed at an outpost for an extended period of time, the crews took better care of it). The Seagram plant, which was the original Seagram distillery built during 1857 in Waterloo, closed in 1992 and has since been converted to condos and office space. Street-running along Caroline St. ended in July 1993 when the last train lead by 8161 and sister 8162 traversed this GRR trackage. 8161, not rebuilt in the 1200-series rebuild program of the 1980's, was sold off in 2004. Way to go, Bill!! As originally mentioned, this image brings back some really fond memories for me. So fantastic you captured this……I’d not otherwise believe photographic evidence of this switch job existed. JP – this track is the former Grand River Railway – the real classics are the steeple cab electrics that once used the line, as well as the passenger cars (all electric). The GMD era was only about 40 years and freight only of course. Pretty rare to see a passenger and/or freight line put back in any capacity. Stephen, the tracks may be coming back to Caroline Street, but a streetcar is quite different than a classic GMD switcher. A wonderful image and a fascinating narrative! THIS is something else. When I worked in Waterloo in 1969 I caught a ride on the switcher a few times during my lunch break. (I worked in Waterloo City Square) So maddening I wasn’t into photography back then. I think I was captivated by the smell of that booze floating over the town. :o) Heavenly. Amazing. As far as I know, this is now the only image of Caroline St. Street Running on the Internet – Thanks for sharing Bill. Even more amazing – is this section of Caroline St is being ripped up now – to re-install a single set of tracks for the Waterloo Region ION LRT system, the Street Running is coming back! And very soon too, about 20 years after the tracks were lifted in 1994.